Stay warm even during your most intense outdoor workouts when you train in this Under Armour Tech Ladies 1/2 Zip Twist Training Top in Tetra Grey, Mojo Pink and Metallic Silver. The Under Armour top has been crafted from tech fabric which is quick-drying and soft whilst feeling more natural. 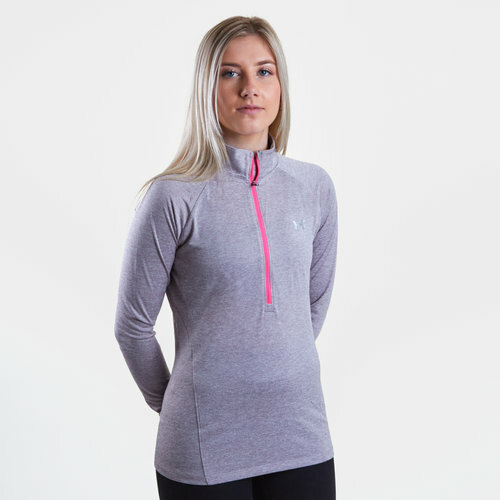 The material wicks sweat away and dries really fast to keep your comfortable always whilst the 1/2 zip front allows you to create your own fit around your neck whilst the stand collar provides extra coverage. With an over the head design, it has long sleeves and comes in a lightweight design in a block colour.